This article is about the American football player. For the pioneer of southern gospel music, see Charles Davis Tillman. Charles Anthony Tillman (born February 23, 1981), nicknamed "Peanut", is a retired American football cornerback. He played college football at the University of Louisiana at Lafayette, and was drafted by the Chicago Bears in the second round of the 2003 NFL Draft. 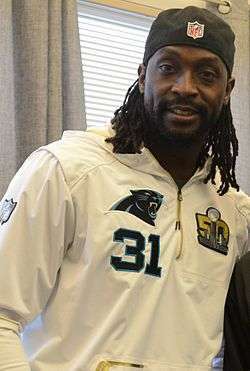 Tillman also played for the Carolina Panthers in 2015 before retiring in 2016. Tillman played 12 years for the Bears, helping them reach Super Bowl XLI. He has been selected to two Pro Bowls and was the Walter Payton Man of the Year in 2013. He is known for his cover skills as well as his ability to force fumbles by stripping or "punching" the ball away from players, with his well-timed punch of the ball commonly known as the 'Peanut Punch'. Tillman was born in Chicago, Illinois, but spent a majority of his youth traveling around the world. His father, Donald Tillman Jr., a sergeant in the United States Army, was frequently stationed in different locations, ranging from United States to Germany. Tillman attended eleven different schools during his youth, but eventually graduated from Copperas Cove High School in Texas. During his time at the school, Tillman was a two-time All-District 8-5A and all-area team selection. The Austin American-Statesman and All-State Class 5A honorable mention named him to the Super Cen-Tex team. He attended the University of Louisiana at Lafayette, where he played for the Louisiana–Lafayette Ragin' Cajuns football team from 1999 to 2002. His Ragin' Cajuns teammates included future Pittsburgh Steelers cornerback Ike Taylor. He started for all four years as a left cornerback after being a wide receiver in high school. Tillman was invited to the NFL Scouting Combine. The Chicago Bears selected Tillman in the second round of the 2003 NFL Draft, making him the draft’s 35th overall pick. He became a starter and recorded 83 tackles and four interceptions during his first year with the Bears. However, an injury during his sophomore year temporarily grounded his career. Tillman rebounded in his third year, recording 93 tackles and five interceptions. His efforts helped the Bears establish the league's best defense in 2005. In 2006, Tillman was the Bears’ leading tackler among defensive backs, recording eighty tackles. He also intercepted five passes (tying for a team high with Ricky Manning Jr.) and forced one fumble. One of the low notes for his season came when he missed the team’s final games due to a back injury. Tillman was involved in a notable incident with Plaxico Burress before a prime-time game against the New York Giants. Days before the game, Giants' receiver Plaxico Burress claimed that the Bears' secondary was "average" and "very beatable". Tillman responded by holding Burress to only eleven yards and even intercepting a pass during the game. Many Bears' fans believe that Tillman should have been voted to the 2007 Pro Bowl, as he recorded more interceptions and tackles than DeAngelo Hall and Ronde Barber. Tillman helped the Bears reach Super Bowl XLI, but lost 29–17 to the Indianapolis Colts. Tillman had 11 tackles in the losing effort. The Bears signed Tillman to a six-year deal on July 24, 2007. On December 8, 2007, Tillman was nominated as finalist for the prestigious Walter Payton NFL Man of the Year Award, which recognizes players who have performed extensive charity work. 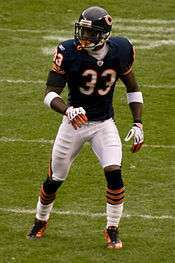 On November 22, 2009, during a Sunday Night Football game against the Philadelphia Eagles, Tillman forced three fumbles in one game, two of which were recovered by the Bears. During the 2009 season, Tillman recorded two interceptions, including one that was returned for a defensive touchdown. He recorded six forced fumbles, the second-most in the League. During a Monday Night Football game against the Minnesota Vikings on December 28, 2009, Tillman collided with Bears safety Craig Steltz while attempting to tackle Visanthe Shiancoe. The impact of the collision cracked some of Tillman's ribs and bruised one of his lungs. He was immediately rushed to the hospital, and released two days later. After the 2011 NFL season, Tillman was voted to his first Pro Bowl. In Week 5 of the 2012 season against the Jacksonville Jaguars, Tillman passed free safety Mike Brown by setting the Bears franchise record for the most defensive touchdowns in a career with 8 when he returned a Blaine Gabbert interception for a touchdown. Tillman is tied with Donnell Woolford for the most interceptions by a cornerback in team history, trailing only safeties Gary Fencik and Richie Petitbon. He also has forced 36 fumbles, which is the most by a defensive back in the league since 2003. On November 4, 2012, Tillman forced four fumbles against the Tennessee Titans offense, the most in a game by a single player in league history since the stat began being tracked in 1991. Tillman was considered by various sources as a Defensive Player of the Year candidate, competing with Houston Texans defensive end J. J. Watt. Tillman was named to his second consecutive Pro Bowl on December 26, making him the first Bears defensive back to be named to back-to-back Pro Bowls since Mark Carrier. He was later named to his first All-Pro team, placed on the first team. Tillman finished the season with ten forced fumbles, which led the league, and his three interceptions returned for touchdowns is tied for the lead league with St. Louis Rams' Janoris Jenkins. In the 2013 season opener against the Cincinnati Bengals, Tillman recorded two interceptions, the second time in his career he had two picks, after 2006 against the New England Patriots. Against the Detroit Lions in Week 10, Tillman tore his right triceps, and was placed on injured reserve with the designation to return, and could return by the playoffs. However, on December 16, Bears head coach Marc Trestman reported that Tillman will miss the entire season, playoffs included. Tillman concluded 2013 with 52.5 tackles, three interceptions and three forced fumbles. In February 2014, the NFL awarded Tillman the Walter Payton Man of the Year to acknowledge his charitable efforts and community outreach programs. The Bears signed Tillman to a one-year contract extension in the 2014 offseason. Tillman suffered his second consecutive season-ending injury during a week 2 match-up against the San Francisco 49ers, when he re-injured his right triceps. Tillman leads the Bears in career defensive touchdown returns (9) and also owns the record for the most career interceptions (36) among all Bears' cornerbacks. On April 9, 2015, Tillman signed a one-year contract with the Carolina Panthers. Tillman recorded his first interception for the Panthers against Andrew Luck during the Panthers 29–26 victory over the Indianapolis Colts. He recorded his first forced fumble for the Panthers during their 37–29 victory over the Green Bay Packers. Tillman left Carolina's regular season finale against the Tampa Bay Buccaneers with a knee injury. MRIs confirmed on January 3 that Tillman suffered a torn ACL and missed the remainder of the season. Without Tillman, the Panthers reached Super Bowl 50, but lost 24–10 to the Denver Broncos. On July 18, 2016 after 13 seasons in the NFL, Tillman announced his retirement from football via a three-minute YouTube video. He signed a ceremonial one-day contract to retire with the Chicago Bears on July 22. Tillman often makes appearances on Fox Chicago Sports shows. He also organizes, runs, and advocates numerous charitable functions. Tillman's Aunt Renee nicknamed him "Peanut", since his body resembled the shape of a peanut during infancy. Safety Mike Brown spread the nickname after meeting Tillman during his rookie year. He and his wife, Jackie, have three daughters and a son. In November 2012, Tillman stated that he may miss the Bears game against the Houston Texans in case his wife went into labor, but ended up playing the entire game. On November 13, Tillman and his wife had their third daughter. Tillman's Cornerstone Foundation mission is to help improve the lives of critically and chronically ill children throughout Chicago. Tillman created the foundation after his second-youngest daughter was diagnosed with cardiomyopathy. Tillman has worked with United Services Automobile Association (USAA) as part of the insurance company's "Thank You" campaign, highlighting cooperation between the NFL and the military services. 1 2 3 4 5 Donnelly, Mike, Charles Tillman - Not Your Typical 'Peanut' (January 18, 2007), nflplayers.com, Retrieved on July 25, 2007. ↑ Greenberg, Jon, Tillman's Peanut Punch for the ages (September 15, 2014), espn.com, Retrieved on June 23, 2015. ↑ Campbell, Rich (2013-10-18). "Tillman and Griffin III have more in common than Sunday matchup". Chicago Tribune. Retrieved 2014-04-02. ↑ "Charles Tillman | Louisiana-Lafayette, CB : 2003 NFL Draft Scout Player Profile". Nfldraftscout.com. 2006-09-21. Retrieved 2012-08-03. ↑ ESPN, Giants' Burress says Bears CBs 'very beatable' (November 9, 2006), espn.com, Retrieved on July 25, 2007. ↑ Canavan, Tom, Chicago 38, NY Giants 20 (November 13, 2006), Yahoo! Sports, Retrieved on July 25, 2007. ↑ Mayer, Larry, Chalk Talk Story - Did Peanut get shelled in Pro Bowl voting? (December 22, 2006), chicagobears.com, Retrieved on July 25, 2007. ↑ Mayer, Larry, Tillman agrees to six-year contract extension (July 24, 2007), chicagobears.com, Retrieved on July 24, 2007. ↑ Mayer, Larry, Tillman named Bears' nominee for Man of Year honor (December 8, 2007), chicagobears.com, Retrieved on December 8, 2007. ↑ "2011 NFL Player Defense Stats - National Football League - ESPN". Espn.go.com. Retrieved 2012-08-03. ↑ McClure, Vaughn (2009-12-30). "Bears' Tillman released from hospital". chicagobreakingsports.com. Retrieved 2009-12-31. ↑ "Tillman among five voted to Pro Bowl". Chicagobears.com. Retrieved 2012-08-03. ↑ "Bears' defense does it again in 41-3 rout of Jaguars". Chicago Tribune. 2012-10-07. Retrieved 2012-10-07. ↑ "Chicago Bears win big, gain steam in NFC playoff race". National Football League. 2012-11-04. Retrieved 2012-11-04. ↑ Jensen, Sean (2012-11-04). "Defensive MVP candidates Charles Tillman and J.J. Watt in Sunday night spotlight". Chicago Sun-Times. Retrieved 2012-12-26. ↑ Rosenthal, Gregg (2012-12-26). "2013 Pro Bowl roster analysis: NFC". National Football League. Retrieved 2012-12-26. ↑ Rosenthal, Gregg (2013-01-12). "All-Pro Team headlined by Adrian Peterson, J.J. Watt". National Football League. Retrieved 2013-01-12. ↑ Mayer, Larry (2013-01-07). "Reviewing Bears season by the numbers". Chicago Bears. Retrieved 2013-01-07. ↑ Mayer, Larry (2013-09-08). "Tillman, Jennings continue to play takeaway in stirring win". Chicago Bears. Retrieved 2013-09-08. ↑ Mayer, Larry (2013-11-11). "Charles Tillman headed to IR with triceps injury". Chicago Bears. Retrieved 2013-11-11. ↑ Mayer, Larry (2013-12-16). "Tillman done for season". Chicago Bears. Retrieved 2013-12-16. ↑ Mayer, Larry (2014-01-30). "Jennings a bright spot on defense". Chicago Bears. Retrieved 2014-01-30. ↑ Rosenthal, Gregg (2014-02-01). "Charles Tillman chosen Walter Payton Man of the Year". NFL.com. Retrieved 2014-02-02. ↑ Jahns, Adam (2014-03-14). "Bears re-sign Charles Tillman". Chicago Sun-Times. Retrieved 2014-09-15. ↑ Alper, Josh (2014-09-15). "Report: Charles Tillman done for season with triceps injury". Profootballtalk.com. NBC Sports. Retrieved 2014-09-15. ↑ Jahns, Adam (2015-04-12). "Charles Tillman thanks Bears fans, Chicago in newspaper ad". Chicago Sun-Times. Retrieved 2015-09-02. ↑ Shook, Nick. "Panthers sign Charles Tillman to one-year deal". NFL.com. Retrieved 9 April 2015. ↑ Redford, Patrick. "Charles Tillman announces retirement with incredible video". Deadspin. Retrieved 18 July 2016. ↑ Wiederer, Dan (2016-07-21). "Charles Tillman expected to re-sign, retire with Bears". Chicago Tribune. Retrieved 2016-07-21. ↑ "Charles Tillman says he will play despite baby's pending birth". Los Angeles Times. 2012-11-08. Retrieved 2012-11-08. ↑ Sessler, Marc (2012-11-13). "Chicago Bears' Charles Tillman, wife welcome baby girl". National Football League. Retrieved 2012-11-13. ↑ Mayer, Larry (2009-04-09). "Tillman humbly accepts award on daughter Tiana's behalf". chicagobears.com. Retrieved 2009-04-08. ↑ "USAA teams with NFL to show military support". Officer. 91 (1). Washington, DC: Reserve Officers Association. Winter 2015. p. 101. Retrieved 2015-04-29. Wikimedia Commons has media related to Charles Tillman.